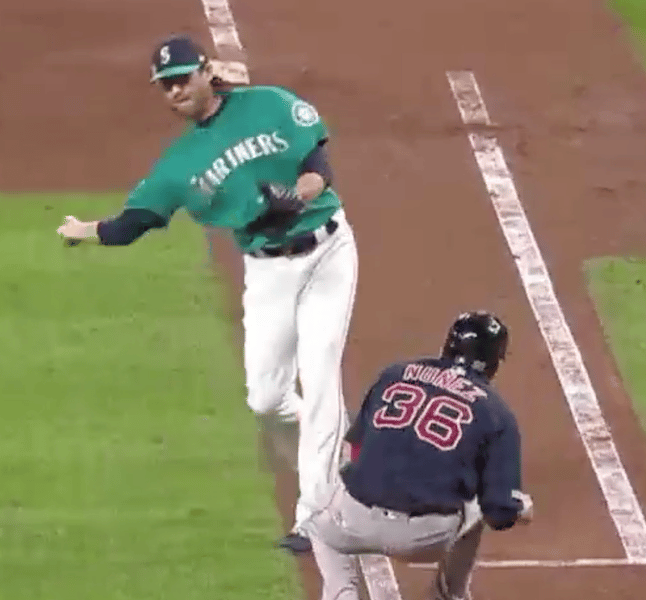 The Mariners and Red Sox played at Safeco on March 29 when this odd double play occurred. The Red Sox had the bases loaded in the top of the eighth inning and one out when Eduardo Nunez hit a slow roller up the first base line that was fielded by pitcher Cory Gearrin, who proceeded to throw home for the force out. The batter/runner, Nunez, stopped running and ducked when he neared Gearrin to avoid being hit by the throw. Nunez never advanced much farther up the line, as he looked back to see the play at the plate. He ducked again when catcher Omar Narvaez fired to first to complete a 1-2-3 twin-killing. RULES DESK NOTE: Running over or barreling into the fielder (in this case the pitcher) could be ruled intentional interference which would result in the batter/runner and the runner from 3B being called out. The runner may run into the fielder but cannot intentionally interfere with the play. The same is true if the runner stops and then intentionally interferes with the play by waving his hands, etc. The batter-runner interference rule refers to the last 45-feet between home and first base. The rule does not prohibit the batter-runner from running outside the “Runner’s Lane,” but if he does, he runs the risk of being called out for interference should the umpire judge that he interfered with the fielder taking the throw at first base. The rule protects the fielder who is “taking” the throw; it does not protect any fielder, including the first baseman, when he is MAKING a throw. The batter-runner interference rule covers throws going to first base, usually by the pitcher or catcher from the bunt area. It does not cover throws going in the opposite direction from first base to home. In the above play, Nunez could have run into Gearrin or walk into the tag to buy time for the runner advancing from home from third. Although it was probably a natural reaction, Nunez, by rule, did not have to duck. By doing so, he gave the pitcher a throwing lane to the plate. He ducked again on Narvaez’s throw to first base. This gave the catcher a better throwing lane. When there is a “run on contact” play with a runner on 3B heading home, and the ball is hit to the first baseman near the line, it’s a good idea for the batter-runner to run in the direction of the first baseman to force him to take a side step to improve the throwing lane. This could buy time for the runner coming home. A lefty batter is usually in a good position to do this but it can also be done by a RHB. When the throw is going to first base, the batter-runner has no restriction the first 45-feet. It’s a good idea, especially for left handed batters on a “strike three” pitch that gets away from the catcher to the right of the plate in foul territory, to run in the direction of the first baseman who is likely setting-up in foul territory. Squeezing the throwing lane makes this a more difficult throw by the catcher. In the above play, let’s assume the runner advancing home was safe and Nunez was subsequently called out for batter-runner interference. Because there was only one out, the run would count because there was an intervening play (Gearrin’s throw to the plate) before the interference. If Nunez was the third out, the run would not score because no run can score when the inning ends on a force out or if the batter-runner makes the third out before reaching first base.